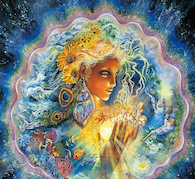 The Shekhinah, the supernatural, sovereign presence of the Divine Eternal Sacred Feminine Essence of God. The Divine Mother Mary, who is the supernatural essence of love of the Divine Mother Essence. Quan Yin, Who is the essence of the Great Mother Goddess Essence aspect in Buddhism. This system allows you to be both a receiver and a channel and invokes the Divine Feminine prosperity energy, liberating and aligning you with all areas of prosperity flow in your life. It helps you to connect to Shekhinah, Mother Mary and Quan Yin’s light, flowing easily to provide you with nourishment and renewal so prosperity transformation can be reached and magnified in all areas of your life. The 999 Divine Feminine Light of Prosperity Essence restores wellbeing, supports you, and brings blessings and mother’s love to you. It assists with relighting the fires of passion within your soul that are in alignment with your path in this lifetime, bringing fruitfulness and creativity gifts to you. You may work with this system for yourself, or others with their permission.